Thank goodness for conscientious readers who take the time to comment. One such reader notified us that in last week’s article on the secrets to making perfect doughnuts, I’d included a recipe for doughnuts, but the recipe didn’t include mashed potatoes. I want to give her a big thank you for passing on this observation. Considering I’d been talking about spudnuts, I can see where our reader naturally assumed the recipe would have been for spudnuts and that the recipe would include mashed potatoes. Now that I think about it, I have to say “OF COURSE my recipe should have been for spudnuts!” So this time around, I’m going to talk about the perfect glazes and conclude with my favorite spudnut recipe, which certainly does include mashed potatoes. (Last week you got my favorite all-around doughnut recipe). So. OK, let’s talk glazes. Some people say it's the glaze that makes the donut. From classic dark chocolate to unusual flavors like matcha green tea and amaretto cherry, you can count on glazes to dress up your treats. MARSHMALLOW GLAZE is a perfect example of a perfect glaze. Mini marshmallows are melted into a simple vanilla glaze for an inspired twist on a proverbial classic. All you do is mix powdered sugar (about 1 ½ cups), vanilla (to taste, but I start with 1 teaspoon), a pinchof salt in a bowl. Then just melt some butter (start with 3 tablespoons) and 1⁄4 cup water in a 2-qt. nonstick pan over medium-high heat. Add 2 cups of mini marshmallows; stir until completely melted, 1–2 minutes. 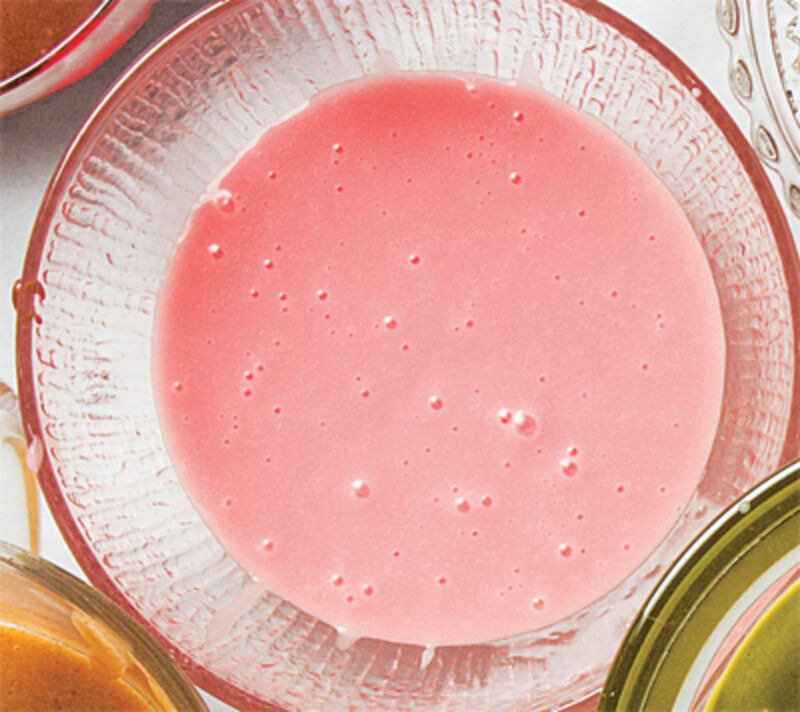 Whisk into sugar mixture, and voila, a perfect and unique glaze. AMARETTO CHERRY GLAZE is a favorite in the neighborhood. You just whisk powdered sugar (about 2 cups), ¼ cup syrup from a jar of maraschino cherries, 1 teaspoon almond extract, and a pinch of salt in a bowl until smooth. Couldn’t be easier or tastier. CREAM CHEESE GLAZE is to die for. Using a mixer, beat together an 8 ounce package of cream cheese, 2 tablespoons of hot water and the seeds scraped from 1/2 of a vanilla bean. Add a pinch of salt and powdered sugar (about 2 cups). 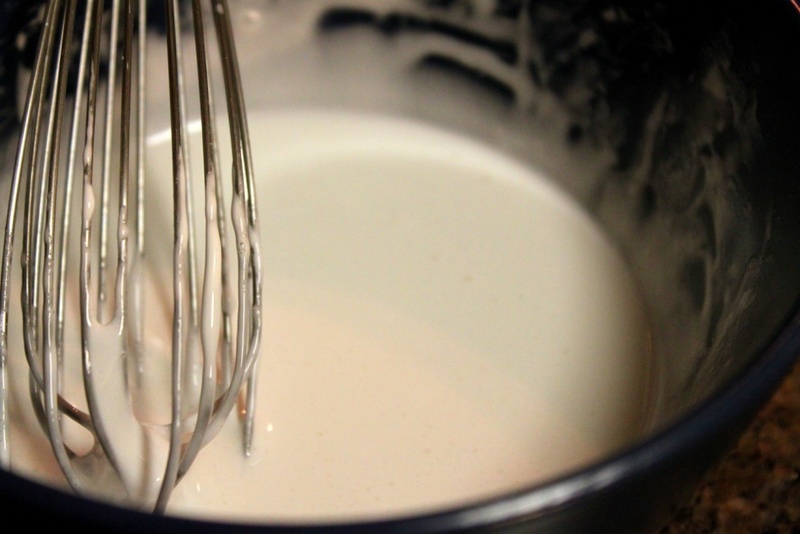 If you don’t have a vanilla bean, just add perhaps a ½ teaspoon of pure vanilla extract. 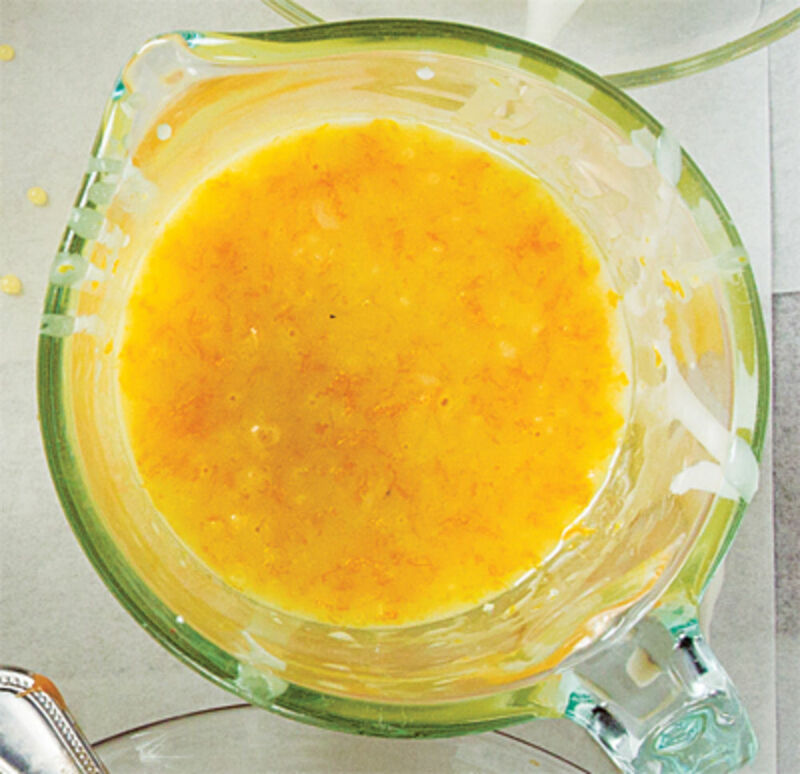 ORANGE GLAZE is also an all-time favorite. This versatile glaze is also used over sweet rolls and monkey bread. I also swirl it into tapioca pudding. You mix powdered sugar (start with 2 cups), 3 tablespoons orange juice concentrate (undiluted), 1 tablespoon finely grated orange zest, and a pinch of salt. This is divine. Next, on to glazing your doughnuts. There’s no real mystery to it, though. 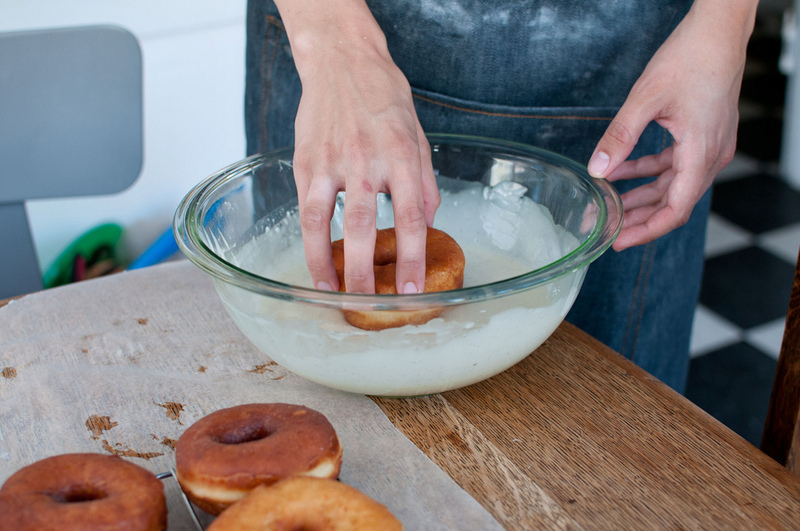 Some folks use their hands, dipping both sides of a warm doughnut into a bowl of glaze; they’re then drained on a cooling rack set in a baking sheet. Some folks think it’s quicker and more efficient to use kitchen tongs for this. Rather than having my glaze in a bowl, I like to have it in a square baking pan. This way I can dip and turn 4 doughnuts at a time; I do use tongs to turn the doughnuts, though. And by the way, you can reuse the dripped glaze that’s caught in the baking sheet. Just scrape it back into your bowl or baking pan and mix it until it’s smooth again. 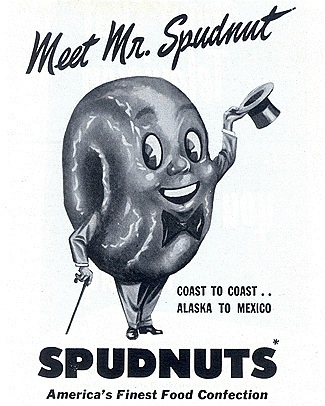 My mouth is watering and I can’t wait to make some spudnuts this weekend. 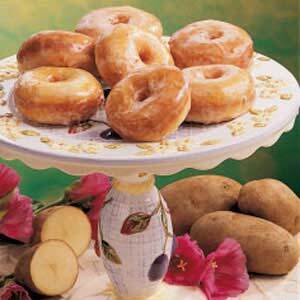 With the perfect glazes and the best spudnut recipe, heaven awaits!